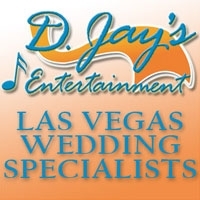 D. JayÂ’s Entertainment has been a fixture in the Las Vegas entertainment business for over a decade. Featuring great wedding and party DJÂ’s, and beautiful photography for weddings, family, and corporate events. 5-Star Rated on several ratings websites, winner of the 2007 Pick for Best of Weddings from TheKnot.com, and WeddingWire Rated in 2007 and 2008. Relax, knowing that youÂ’ve hired the highest rated, most award-winning DJ and Photography service in Las Vegas, D. JayÂ’s Entertainment.